Chris Hughton has backed his "distraught" Brighton side to lift themselves for the play-offs. The Seagulls had been among the Championship pace setters all season but missed out on automatic promotion when they drew 1-1 at Middlesbrough on the final day. 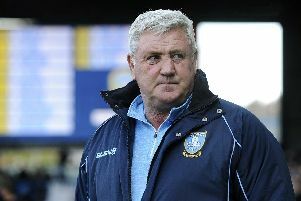 They now face Sheffield Wednesday in the first leg of their semi-final on Friday night at Hillsborough with Hughton confident they can still follow Burnley and Boro into the Premier League. "The disappointment they showed on Saturday at Middlesbrough highlights how close we have come to automatic promotion," the Brighton boss said at his pre-match press conference. "They are a very motivated squad and I would rather have seen a distraught changing room than anything different, and that's because you can see what it means to them. "We didn't come away from the game with a loss and there were a lot of other positives the players gained. "They were distraught but I think that's something they will use to their benefit. "We now have to approach the Sheffield game the same as every other game this season. "You have to have a similar approach to every game, it shouldn't make it any different just because it's a play-off game. Once you start doing things differently, it can knock you out of your rhythm. "Our approach has been the same this week and we'll look to get the same response." Captain Gordon Greer is desperate to make it third time lucky after play-off heartbreak in 2013 and 2014. Under Gus Poyet the Seagulls were dumped out by fierce rivals Crystal Palace in the semi-final and 12 months later, with Oscar Garcia in charge, they lost to Derby at the same stage. "The play-offs have not been a great experience since I've been at Brighton," Scotland defender Greer told the Argus. "Going up would definitely be my proudest moment in a Brighton and Hove Albion shirt. "It's the aim of the club to get to the Premier League. I'm sure it's the aim of a lot of clubs in the Championship to get there. "But the infrastructure here is fantastic - the training ground, the stadium, all the staff, the players. "It's just about us trying to get it right on the park and hopefully we can do it."